By Bernie May, in the Wycliffe Bible Translator’s bimonthly publication ‘In Other Words,’ sometime in the the mid-1980’s. Bernie May was the U. S. Division Director of Wycliffe and one of his duties was to speak to groups to raise funds for Wycliffe’s work in translating the Bible for people around the world who do not yet have it in their own language. I get a lot of invitations to speak in churches, to civic organizations, and special interest groups. I turn down most of them because I simply don’t have time. But the ones I do accept have caused me to re-evaluate my entire concept of persuasion. One of the reasons I have been reluctant to speak is I know most people are simply not interested in what I have to say. Oh, maybe the pastor has a heart for missions. Some of the people may have the vision. They may even be Wycliffe supporters. But the vast majority of the people in the churches of America do not care about missions— much less about Bible translation. It’s not that they are intentionally uninterested in missions. They just have other priorities. You know, it’s hard to be concerned about people you’ve never met, who live in a land you’ve never visited, and have names you can’t pronounce— especially when your only car has a broken transmission and you don’t have a way to get to work. Most of the people sitting in the pews today are simply trying to survive. They have problems at home. Their kids are rebelling. They’ve been told their job is phasing out. They have elderly, parents who have great needs. Even the strongest of today’s Christians are bombarded with incredible pressures. The same is true with pastors. Most pastors understand the Great Commission. They want their churches to be mission minded. They believe the Bible is the Word of God and know it should be placed in the hands of every tribe and every nation— in their own tongue. But it’s hard to keep up a mission emphasis when U.S. Steel has just closed down its plant and 30 percent of the congregation are suddenly out of work. Or the associate pastor has just confessed he’s been having an affair with the secretary. Or the deacons have just had a secret meeting to discuss the recent shenanigans of the pastor’s teenage son. So, I’ve been asking myself: Do I have the right to break into someone’s thoughts when his car won’t work or he’s just learned his father is dying? Or the right to talk about something which he feels does not even apply to his situation? Something like Bible translation? Yet I know if a man is going to be blessed by God, he has to start thinking as God thinks. God’s concerns need to become his concerns. If he is ever going to tap into the resources of God, which I believe are for all men— happiness, health, prosperity, peace with self and all mankind— he has to do it God’s way and by thinking God’s thoughts. What are God’s concerns? I think God is deeply concerned about this world, and about the people of this world. He gave His only Son so the people of this world could have eternal life. If that message is not taken to the world, then God’s will is not done. Whom does God want involved in taking the message? Whom does He call? He calls the man who has just learned his father is dying. He calls the woman whose car has just broken down and she can’t find a ride to work. He calls the preacher whose family is having problems. He calls us all. The Bible says the way we find the answers to our problems is through concern for others. The man who loses himself in caring for others finds himself, Jesus said. When I give up my concerns for the sake of others, I find the answers I need for myself. I realize it doesn’t make sense. In fact, it doesn’t make sense to me. But I know it’s right because every time I put it into practice in my own life, remarkable things happen. For instance, Nancy and I have learned that when we begin to have financial problems, we start looking for something we can give money to. And invariably God meets our need. What I’m saying is, it is right for me to invade the lives of people with great problems and challenge them with the needs of the world. The finest way I can help people is to get them thinking God’s thoughts. And God is always thinking about the people who don’t even have the Bible. JESUS INTERRUPTS FOUR MEN: Matthew 4:18-22 — As Jesus was walking beside the Sea of Galilee, he saw two brothers, Simon called Peter and his brother Andrew. They were casting a net into the lake, for they were fishermen. “Come, follow me,” Jesus said, “and I will send you out to fish for people.” At once they left their nets and followed him. Going on from there, he saw two other brothers, James son of Zebedee and his brother John. They were in a boat with their father Zebedee, preparing their nets. Jesus called them, and immediately they left the boat and their father and followed him. 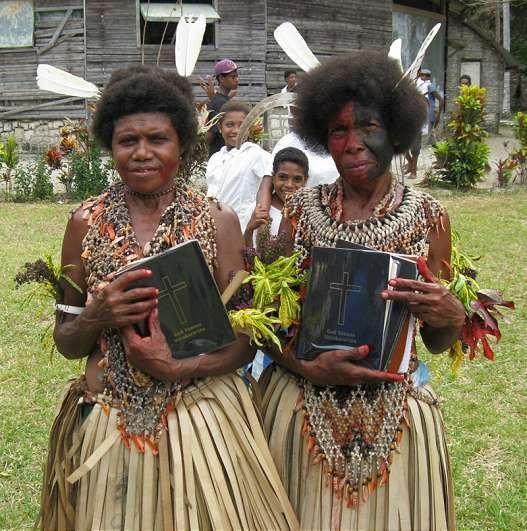 Two women from Papua New Guinea show their new Bibles in their own language provided by Wycliffe translators.